The Morning Post (London, England) newspaper has a delightful and delightfully-useful column called “THE FASHIONABLE WORLD“. I’ve found notice of card parties, dinners, routs – with LONG lists of guests. I think many will find these columns of use. As I get time, I’ll post a new one. They may begin by having TIES with my dear Smiths & Goslings, but I hope even those columns will provide hours of reading pleasure. My people attended – and gave – TONS of parties! The early years will be what I concentrate on first. On Sunday evening her Ladyship had one of the most elegant parties, yet given in the circles of fashion. Braham was in very fine voice, and Storace exerted herself with equal success. It was remarkable that Cramer was never heard to greater advantage. There were besides much fine singing and playing; but what seemed most to charm was a duet, sweetly sung by Lady Louisa Stratford, and a Gentleman amateur, accompanied by the Spanish guitar. By the bye, this instrument seems to be daily gaining ground on the public, and is now to be met with in most of the circles of fashion; it is undoubtedly a sweet accompaniment of the voice. A Mr. Zanoni played several Italian and Spanish airs with fine execution. The company was very numerous; among them we observed the Countesses of Westmoreland and Jersey; Ladies Milner, Folkstone, and two Rodneys; the Marquis of Lorne, Earl of Jersey; Lords Heathfield, Ossulstone, and Villiers; Generals Megan and M’Carthy; Messrs. Bouverie, Walsh Porter, Lamb, two Carews, Salisbury, Rodney, Lewis, Knight, Craven, and Sheridan, several foreign Noblemen, and others of distinction, were present. The company were so highly delighted, that they did not separate till a very late hour. Monday, 16 May 1801 – Mrs Drummond Smith’s Rout. Wednesday, 19 February 1806 -Lady Drummond Smith’s Card Party. Friday, 18 May 1810 – Lady Drummond Smith’s Assembly. 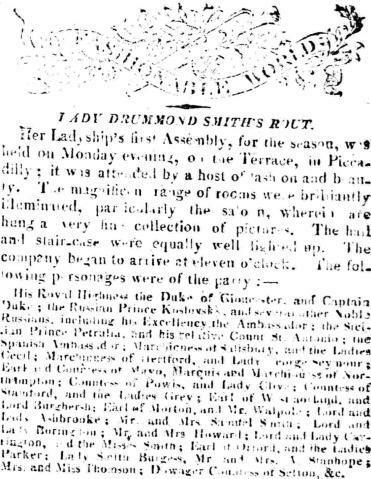 Thursday, 20 May 1813 – Lady Drummond Smith’s Rout. Saturday, 19 March 1814 – Lady Drummond Smith’s concert.